Tom Pringle (AKA Dr Bunhead) has been a globe-trotting, freelance science communicator for almost 20 years. He is internationally renowned as a pioneer of performance-science shows and immersive training programmes in science communication, public engagement and CPD for school teachers. He performs spectacular, live and TV science shows all over the world and has trained thousands of people (including scientists, students, teachers, technicians & science presenters) in many languages and cultures, across all six inhabited continents. Occasionally, he writes bits & pieces for the press, educational journals and books. He performed his first "100% pure live science" show in 1995, developing a unique approach that has been much copied since. In 1996 he formed Dr Bunhead's Science Education, dedicated to pioneering character-driven, performance-science. With increasing audiences being drawn to his mould-breaking, academic anarchy it wasn't long before he was called upon to provide training in the techniques and principles behind his approach. This training component has grown, since 1997, to become a separate business, Bright Sparks. 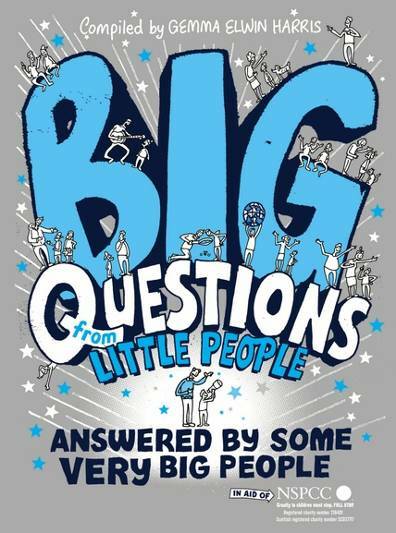 Dr Bunhead's shows span age groups from five years old to adults-only offerings of a gratuitously scientific nature. His "stunt scientist" persona has brought accessible and engaging science into classrooms, universities, theatres and TV sets around the world; from grand opera houses to tin huts, from outback Australia to the Himalayan foothills. For lovers of stats, he has delivered over 1,800 events to more than a quarter of a million people at over 500 venues covering; Iceland, Netherlands, Germany, Poland, Ethiopia, Jordan, Saudi Arabia, United Arab Emirates, India, Malaysia, Singapore, Hong Kong, Indonesia, Japan, Australia, New Zealand, USA, Brazil, and a few, more local joints. Bright Sparks training courses unfold the competence, confidence and creativity of participants through a blend of explanation, inspiration and immersive activities. These courses has been carefully designed to prepare anyone (from nervous novice to experienced speaker) to present engaging and accurate science, to lay audiences, in a truly memorable and exciting manner,. Based upon established educational principles and incorporating latest research developments, these courses are continually updated to reflect feedback from students and host organisations. Tom's TV work has been broadcast worldwide by BBC, Discovery, Sky, Disney and several other channels not famous enough to impress anyone. He featured in all 6 series of Sky One's cult show "Brainiac: Science Abuse" and both series of BBC's "Hyperlinks'', with other appearances on BBC's ''Blue Peter'', ''The Weather Show', ''The Slammer'', ''Life According To Fred'... alongside occasional BBC radio appearances. For over a decade he has toured theatres and festivals worldwide, including The Royal Institution - the historic home of public science performance. 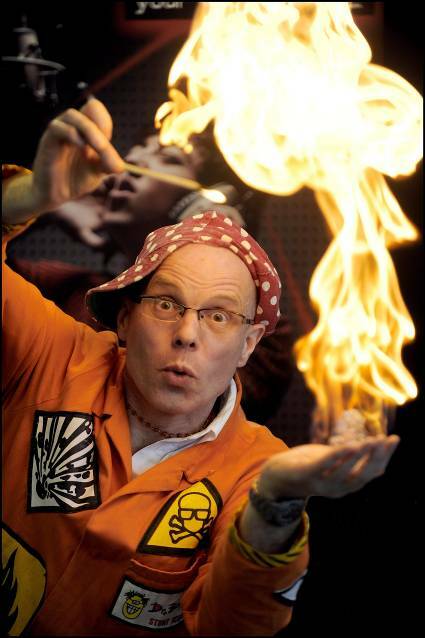 In 2004 Tom brought the first ever live science theatre to London's West End, with the hit show "Dr Bunhead's Recipes for Disaster"; bridging the gap between science education and popular entertainment. This and other productions have toured worldwide. 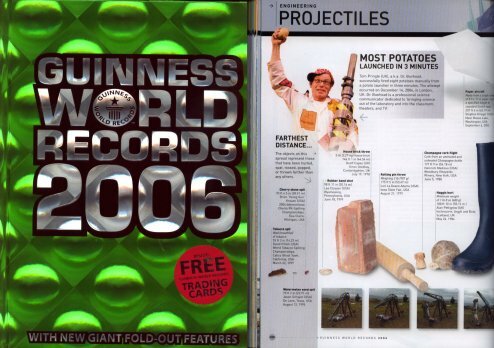 Despite all this, his proudest moment was entering The Guinness Book of Records for the most potatoes fired from a spud-cannon in 3 minutes. This monumental contribution to science earned him another Blue Peter badge (he now has 5 and has not attempted to sell any of them on E-Bay). A second Guinness World Record was added in 2011 when he made the longest glow-in-the-dark necklace; worn simultaneously by 108 people, it was over 1,000 feet long, and looked very cool! Having left the University of Bath with a degree in chemistry and a PGCE in secondary science education he spent long enough in retail management for most of his hair to fall out. He then returned to academia, obtaining an M.Sc. (Surface Science & Catalysis) at the University of Liverpool. Several more years in research, at the University of Edinburgh, gained him an M.Phil. in chemistry. His ambition is still to obtain a Boy Scout badge. Bored to death in the lab he started doing free science shows for local schools in Edinburgh. This quickly led to arguments with his supervisor and a swift change of career. It's at this point he became, what he pretentiously refers to as, a 'performance scientist'. Really he just likes showing off and blowing stuff up. When he's not writing, performing or testing out new 'extreme science' demos he goes rock climbing and cycling (but not at the same time). He also loves ice-skating and is obsessed with Argentine tango dancing. He prefers Earl Grey tea (no milk, no sugar) and a couple of biscuits would be nice - three would be better.